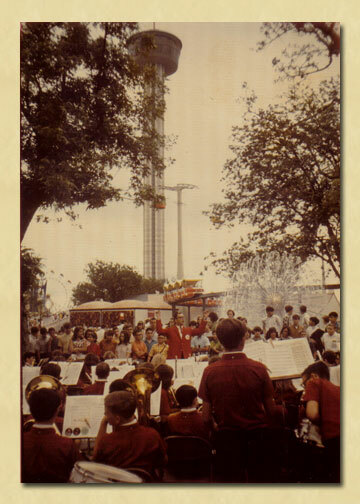 1968 HemisFair World's Fair in San Antonio Texas. Ed Solomon, musician / composer / arranger / performer / teacher, had a musical career spanning fifty years. Trained at the college level as a performing musician, he graduated from the Navy School of Music in the early fifties and served as a composer/ arranger for one of the fleet bands. Ed teaching at James Madison High School in San Antonio about 1977. Returning to finish a music degree at Oklahoma Central University, he began his teaching career as an instructor of instrumental music. Earning a Masters degree in Music Education at North Texas University he taught bands, orchestra, and choir in Oklahoma and Texas for thirty-five years. 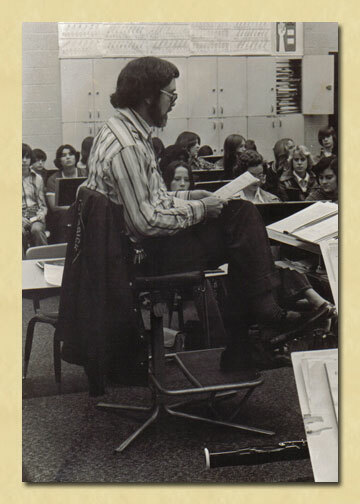 In addition to public school activities he lectured and taught in various advanced settings, wrote articles and teaching materials for the Instrumentalist Magazine, and composed some 300 titles for student solo and ensemble instrumentalists. His material appears on many state solo and ensemble required music lists. A charter member of the Texas Association of Music Adjudicators, he officiated as part of judging panels at all levels of Texas music competition for twenty-five years. His own performance groups achieved thirty years of sweepstakes presentations. He served as clinician and guest conductor for numerous school districts throughout the state. His musical venues included both vocal and instrumental arenas and included dance jobs, concert band work, the San Antonio opera chorus, the Mastersingers, rodeo and circus performances, summer music theater, band camps, and twelve years with the San Antonio Municipal Band as player and board member. He was a member of the American Federation of Musicians and the American Society of Composers and Publishers. His publications are with Southern Music Company and R.B.C. Music Company both of San Antonio, Texas. Upon his retirement from the public school classroom in 1986, he served as a music education consultant and was Artist in Residence in the San Antonio Independent School District. As a private instructor he served in several of the metropolitan schools districts finishing out a long and successful career. Links to music publishers where Ed Solomon's music works can be purchased. Both have online catalogs which show all their publications.